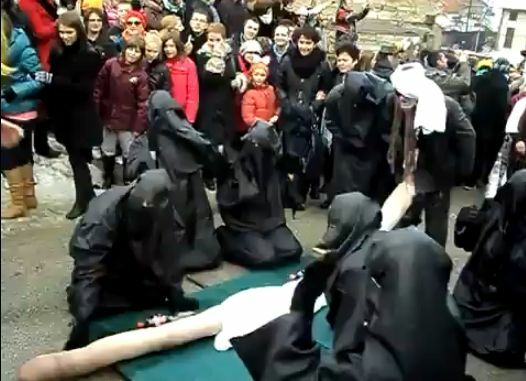 Muslim leaders in Macedonia appealed for calm on Monday among community members outraged over a carnival in which Orthodox Christian men mocked Muslims by dressing as Burqa-clad women. The incident at the Jan. 13 Vevcani festival has prompted angry, sometimes violent demonstrations by Muslims, who make up 33 percent of the country's 2.1 million population and accuse the majority of stoking hatred against them. On Saturday, some protesters attacked buses and defaced a Macedonian flag and replaced it with a green flag to represent Islam. On the same day, a church was attacked by unknown perpetrators in the nearby village of Labunista. In a statement Monday, Macedonian Muslim leaders called for restraint but also accused the government of promoting Islamophobia.